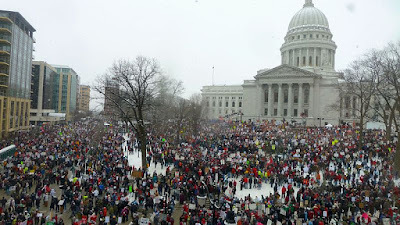 As the country watches the protests unfolding in Wisconsin over Gov. Scott Walker’s plan to remove the right of government employee unions to bargain collectively, many Georgians are probably wondering whether the Peach State might see a similar revolt by teachers over attempts to cut pay and benefits. Many states share Wisconsin’s problem of deficit spending due to the recession and falling tax revenues, as well as expensive contracts with state government employees. While Georgia has shared Wisconsin’s budget problems over the past few years, it does not have Wisconsin’s problem of out of control public employee unions. In Wisconsin, all teachers are required to be members of the teacher’s union. The government deducts union dues from each teacher’s paycheck and funnels the money directly to the union. In return, the union funnels a portion of the money back to politicians, usually Democrats, as campaign contributions. These politicians then negotiate sweetheart deals for the union members when it is time to renegotiate their contracts, often neglecting to fund promised items such as pensions. In the current crisis, fourteen state senators, all Democrats, have fled the state to avoid giving Gov. Walker the needed number of votes to pass the law. Essentially, the senators are thwarting democracy to keep the system alive. Not surprisingly, the Wisconsin system has led to growth in government salaries and benefits. Not only do government workers in most states make significantly more than their private sector counterparts, they have more generous benefits for which they pay a smaller share. Wisconsin teachers reportedly have two state-funded pension plans at a time when many private employees do not have one at all. Ironically, these generous benefits and paychecks are funded by taxpayers, who often have to pay larger portions of their own health and retirement benefits from a paycheck that is, on average, smaller than that of government employees. It is a wealth transfer that benefits the wealthier government employees. It is also not surprising that this has led to an explosion in union membership among government workers. According to the Bureau of Labor Statistics, the rate of union membership among government workers (36.2%) is more than five times higher than that of private workers (6.9%). The Wisconsin system is a relic of the days when tax revenues seemed inexhaustible. If funds ran short, the government would simply raise taxes. Today it is unworkable. In an economy ravaged by the Great Recession, it is impossible to continually raise taxes to pay for expensive government programs (or expensive government workers) without doing further damage to the private citizens and businesses that provide the real engine for economic growth in the state. The 2010 census revealed that people and businesses are fleeing high tax states for those that are friendlier to business. In contrast, Georgia is a right to work state where workers cannot be forced to join or contribute to a union. According to USA Today, government workers in Georgia already earn almost $3,900 less than private workers on average. Georgia state employees also do not have collective bargaining rights with the state. This means that the state can enact pay cuts and layoffs without going through lengthy negotiations with the union. This means that Georgia’s governor can act quickly to trim the budget in times of fiscal distress. Georgia teachers have already faced pay cuts, furloughs, and layoffs over the past few years. Georgia is tied with Arkansas for the second lowest rate of union membership in the country, but what really differentiates Georgia from Wisconsin is that Georgia’s union members do not have the ability to negotiate with bureaucrats for pay and benefit increases while bypassing the taxpayers who, in reality, must foot the bill. This means that, while Georgia state employees may be impacted by further budget cuts, their salaries are already much closer to market rates in the current economy than those of states where collective bargaining has established artificially high wages. Georgia is also in much better shape with respect to pension liabilities. States like Wisconsin and California have massive unfunded pension liabilities that threaten to sink the entire state economies. These states did not set aside money to pay pension benefits for their employees, instead gambling that the money could be raised through higher taxes or economic growth. Wisconsin’s unfunded pension liability is a staggering $77 billion. In contrast, Georgia’s state employee pensions are almost totally funded. It is also unlikely that all or most of Georgia’s Democratic legislators would flee the state to prevent a vote on legislation. In the General Assembly, a majority of members is required to transact business. The Georgia Senate is made of 56 senators, of which 20 are currently Democrats. The House of Representatives has 180 members. Sixty-three representatives are currently Democrats. Therefore, even if all Democrats left the state, there would be enough Republicans left to conduct business. Wisconsin is one of only a few states to require a supermajority to pass legislation, and then only in budgetary matters.